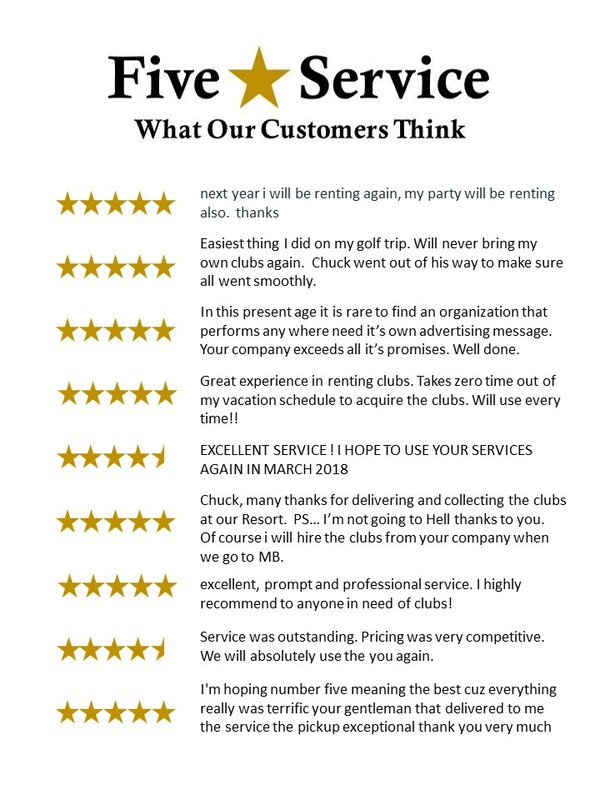 Golf Club Rental Express prides itself on quality customer service. It all begins with a prompt response to each request we receive. We are upfront as to what we can and cannot do for you. If renting is not the right solution for you we will tell you. We are upfront as to what our costs are, no hidden fees. We will go out of our way to make sure you get your clubs delivered to your preferred destination, at the best possible price and when you need them. Whether we are delivering down the street or shipping to the farthest reaches of our delivery area, we will make sure that the clubs get to you on time. We will always look for the most cost effective and least expensive way to get you your clubs and the easiest way for you to return the clubs. We know accidents happen and damage to clubs is a reality of this business, to put your mind at ease, we include our limited damage waiver on each set, if a club is damaged or broken we will cover it up to $75.00. Customer service is the heart and soul of our business and making sure that you are happy with your experience is what keeps us going. Each year at this time we send out a survey to our customers to see how we are doing. The following is a sampling of what we got this year.